The Nintendo DSi, the much awaited third version of the Nintendo DS, was finally announced last October 2, 2008 in Tokyo, Japan at the Nintendo Conference. As with its predecessors, the DSi looks as stylish with a few improvements. 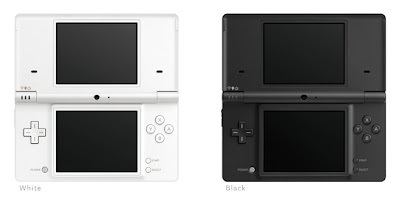 The DSi will be approximately 12% thinner than the DS Lite. It will also house two cameras, on external and another one beside the DS mic. It will also have slightly larger screens (3.25 inches), and much improved speakers. The Power button is also moved, now located at the bottom left of the touch screen. Also, an SD card slot is added for storage of software and media files. The DSi will also ship with its own built-in web browser. One big change is that the GBA slot is removed. This means the DSi cannot play Game Boy Advance games, and cannot make use of previous DS accessories that uses this slot. DSi owners can also download games and software on Nintendo's online store. The Nintendo DSi will be available in Japan on the 1st of November, 2008. The fist editions will be in matte black and white, with no future colors announced as of yet.